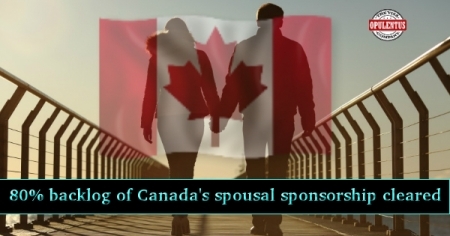 The Canadian Government made an announcement that it has cleared 80 percent of its backlog in spousal sponsorship. Ahmed Hussen, Minister of Immigration, Canada stated this as a part of the Valentine Day update. This was the achievement upon the government promise made in December 2016 for reducing the backlog by 80 percent in a year. In December 2016, the backlog was 75,000 in the canada spousal sponsorship, but presently 80 percent of the spouses figuring in the backlog have received decisions regarding their applications. The present backlog is 15,000 only he added. He also stated that migrating to a new country was a difficult process, for the spouses and partners separated by time and distance. Canadians having a partner/spouse who stays abroad need not have to wait for a long time to immigrate to Canada. There must be no uncertainty whether they will be permitted to stay in Canada. The applications which are still being processed will be dealt diligently by the government and processed soon. He announced that the guide and checklist regarding the spouse and common-law partner sponsorship has been revised. Under this, applicants for spousal sponsorship will have to submit their Schedule A – Background/Declaration Form and Police Certificates in their initial paper application itself, instead of having a delay, as was previously the case. These changes have the aim to process the applications in a fast manner and evade any delay. Canadian government has made family reunification a top priority and has also introduced several policy changes, including the promise to process spousal sponsorship applications within 12 months from the date of receipt. Before these changes the average processing time required for common-law partners and spouses of its citizens and PRs in Canada was 26 months. The government had also introduced the spousal sponsorship application kit in December 2016, which aimed to streamline and simplify the process.